A new invention uses inflatable cushions to carry women across difficult terrain. Enter the maternity saddle -- a new invention that promises to carry women in labor across Afghanistan's difficult terrain so they can get the medical care they need. 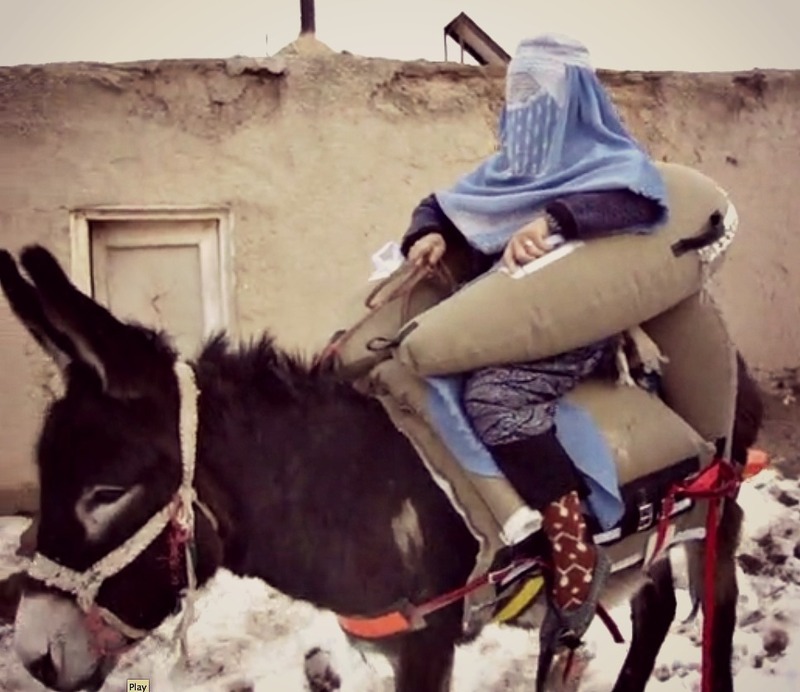 The British charity HealthProm and designer Peter Muckle developed the inflatable donkey saddle to ease the burden on women about to give birth in remote areas of Afghanistan. The lack of suitable transport in mountainous areas leads many pregnant women to opt against heading to health centers in favor of giving birth at home, raising the risks for both mother and child should complications arise. According to Muckle, his invention provides a lightweight and comfortable way for women in labor to get the medical attention they need. "HealthProm found that there was no comfortable way for women to travel in order to give birth," he says. "And they also found that if they did give birth in the health centers there was much more chance for them surviving." The final version of the "donkey ambulance" was showcased during an exhibition of low-cost, frugal medical technology in London earlier this month. Muckle pieced the saddle together using inflatable camping cushions, the armrest from an air bed, and part of an inflatable pool lounger. Four prototypes of different designs and sizes have been assessed and tested over the past year in Charkent, a mountainous district in the northern Balkh Province. The best elements of the prototypes were incorporated into the final design. Dr. Azada Parsa, the project manager of HealthProm's Safe Motherhood Project in the provincial capital of Mazar-e Sharif, says the feedback has been "very positive." "The donkey saddle is very safe and secures the pregnant woman during her transfer to the health center," she adds. "They are very happy with this saddle and they are coming to the health center all the time while they are in labor." In Charkent, the journey to health centers or midwives can take up to four hours, often at night, under uncomfortable and dangerous conditions. With this saddle, Parsa says she hopes more women will be encouraged to make the long journey rather than giving birth at home in unhygienic conditions and without access to medical expertise. HealthProm is looking for donations in order to produce and distribute the final version of the $120 saddles to Afghan villages. A tailor in Mazar-e Sharif with previous experience working with heavy cloth has been chosen to construct eight saddles to be handed out this year. By next year, Muckle hopes every component will be produced locally and that it will be possible for the saddles themselves to be made by anyone. "It's a pattern that I've made, so it's something that we are not selling really as a saddle -- we're giving the pattern to people to copy," he says. "So the idea is to make it a simple pattern that works very well [and] that people can make themselves."